Offering Orlando Squirrel Removal since 2013. Free estimates! We will do our very best to see you today! Orlando Squirrel Removal. Give us a chance to beat our competitors’ prices! 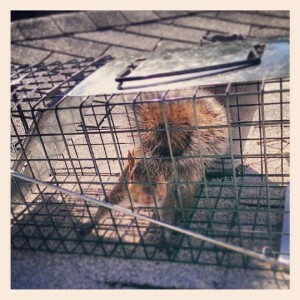 Squirrel removal in Orlando is a problem we deal with year-round. Because we don’t have as strictly defined seasons here as states to the north of us do, squirrels are constantly procreating and nesting inside homes. Florida Wildlife Busters will solve all of your Orlando Squirrel Removal problems, call us now at 407-733-8623! There are three different types of squirrels found in Central Florida, the Eastern Grey Squirrel (sciurus carlinensis), the Southern Flying Squirrel (glaucomys volans), and the Fox Squirrel (sciurus niger). The Eastern Grey Squirrel is, by far, the most common squirrel in Central Florida, it’s common to see them running around outside in yards and trees all day. Unlike their distant relatives. and fellow rodent troublemakers, the rat, these squirrels are diurnal and are most active around sun-up and sundown. The Eastern Grey Squirrel commonly nest in trees in the wild but will quickly make nests in an attic after finding (or making) a way inside. The Southern Flying Squirrel isn’t quite as common as the Eastern Grey but can regularly be found inside attics as well. These squirrels are much smaller than the Eastern Grey Squirrels and are nocturnal, most active in the middle of the night long after the majority of Floridians have gone to sleep. The Fox Squirrel is the largest of the existing tree squirrels, commonly growing between 18 and 28 inches long. They are uncommon in Central Florida and normally only seen in undeveloped wooded areas. Like the Eastern Grey Squirrel, Fox Squirrels are diurnal and typically nest in trees although they spend a lot more time on the ground. Squirrels of any type don’t typically carry the same stigma as the other animals we regularly remove from homes, but this complacent attitude is a detriment to anyone unlucky enough to have their home invaded. Once inside the attic, squirrels and rats are essentially the same animal to anyone living under them. They carry many of the same diseases and do all of the same damage inside of the attic that rats do. Squirrels will urinate and defecate throughout the insulation, chew on air conditioning ducts, electrical wiring and plumbing pipes, and gnaw away at the wood both inside and outside of the home. Aside from that, they commonly chew away the lead wrapping around PVC or methane release pipes on the roof of the home exposing the wood roof decking to the elements and possibly causing roof leaks. That said, the easiest way to find out you have squirrels in your home is an obnoxious clatter coming from above the ceiling in the early morning and the evening hours. These animals d0n’t need a large opening to access the attic and it takes a well-trained eye to quickly identify all of the possible access points to your home. The good news is: regardless of which critters may be causing you distress, Florida Wildlife Busters is capable of quickly determining your problem and effectively solving it for good. Squirrel removal in Orlando isn’t easy for anyone, but once we determine the methods they can use to enter your home, we can seal these areas off completely, guaranteeing your home free of squirrels.